The first edition of the Fundamentals of Tibetan Medicine, published in 1981, has remained one of the most popular and widely used publications on Tibetan Medicine available in English. In 1995, a second revised edition was published in response to an increasing interest in Tibetan medicine and a greater demand for literature on the subject. The need for a third revised edition was again felt and in 1996, the Director of Men-Tsee-Khang appointed us to expand and revise the book. However, due to our other Institutional responsibilities, we could not begin work on the project until the summer of 1997. We are pleased to bring out this book, started initially during the Directorship of Mr. Tsering Tashi, and completed with the encouragement of our current Director, Mr. Pema Dadhul Arya. The support of both Directors has been invaluable. In this Third Edition, as in the Second, alterations, additions and deletions have been made to material from the edition preceding it. The material in Part One has been divided into four distinct chapters, with the addition of an introductory section on the history of Tibetan medicine. Where new information has been added from the rGyud-bZhi or its commentary Vaidurya sNgon-po and the original text was too complicated or technical for the purposes of an introductory book such as this, we have attempted to simplify the material without sacrificing the essential points. In doing so, errors or omissions may have occurred, for which we take full responsibility. When it seemed useful, we have condensed material into tables. We have updated some photos from the previous edition and also have added a pronunciation guide to Tibetan medical terms. It is our sincere desire that all who read this book will benefit from it and experience good health. Birth, old age, disease and death always have been part and parcel of our life in the realm of cyclic existence. However, humankind always has sought and devised theories to explain the causes of disease and has developed various techniques for its prevention, alleviation, and cure. Interpretations of health and disease differ from one society to another in accordance with each of their unique cultural backgrounds. Early humans ascribed disease to the evil influences of malignant souls (ghosts, devils, etc. ), magic and incantations. The ancient Jews regarded disease as an expression of the wrath of God; the Chinese viewed disease as disharmony between two opposing forces of Yin and Yang or the Five Elements; the Indian Ayurvedists viewed disease as a result of improper proportion of the Tridoshas of Vayu, Pitta, and Kapha; and the ancient Greeks attributed the cause of the disharmony of phlegm, black bile, yellow bile and blood. 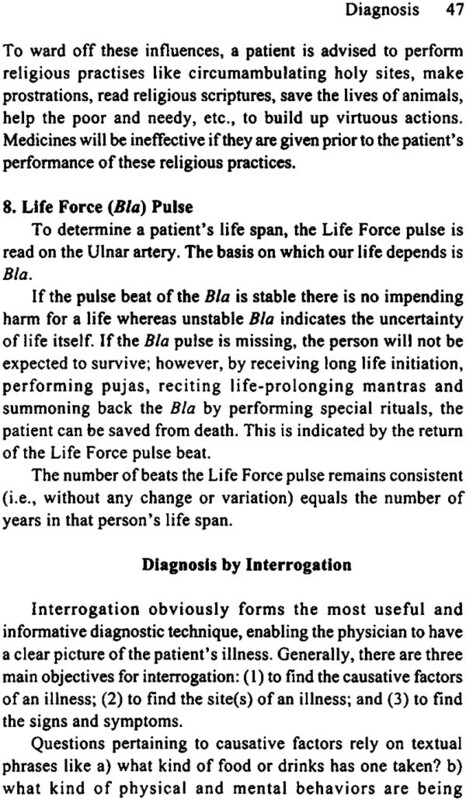 The understanding of health and disease in Tibetan society is explained extensively in a system of healing known as gSo-ba Rig-pa or the Science of Healing. The original teachings of this system are generally attributed to the Buddha, who is said to have taught the root of this tradition in the manifestation of Medicine Buddha (Skt: Bhaishajya Guru; Tib: Sangs-rgyas sman-bla). The essential aspects of his teachings are touched upon widely in the rGyud-bZhi or the Four Tantras.